Reeves Peterson is a comedian, songwriter and recovering crisp addict. After only two years of performing Reeves has racked up over 200 performances, been a finalist in You Must Be Joking, won the Comedy Café New Acts and became the first English speaking comedian to headline the Suomen Stand Up Club Helsinki, Finland. performs topical songs for Richie and Caroline at Breakfast. His cynical observations and superbly crafted songs have made him an in demand act particularly when required to open up a show. Reeves also appears regularly on the cabaret/alternative variety circuit where he performs song only comedy sets. 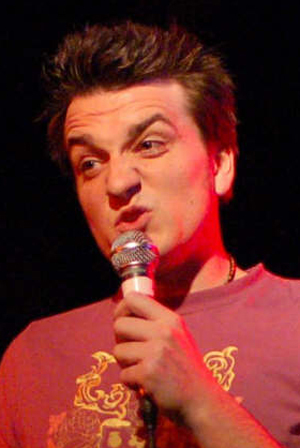 He has performed paid slots and M.C 'd for Mirth Control, Christian Knowles, Comedy Café, Twisters, Oi Oi comedy, Paul Tresgaskis, Ribticklas, Sidesplitters, Chris Mayo, Firmarock (Finland) and many others. numerous student gigs including Brighton University, Bournemouth University, Farnham College, Royal Holloway University, The Arts Institute at Bournemouth, University of Bognor, The London School Of Economics.